DVLA is committed to moving away from its traditional infrastructure and services onto a new open standards platform. We started the journey on the Vehicle Excise Duty reform project and we’re already making great progress. But how do we turn that strategic vision into a reality? How do we combine complex technical redesign with transformational service redesign? The answer: with difficulty! Several months ago, as a group of service managers we met with our colleagues from technical architecture and started to map out how we would do this. We started with a set of technology and service principles. We asked: what did we want to achieve, and what were our guiding principles? We came up with a vision of what was needed from a technological and service viewpoint, taking into consideration our future IT strategy. Using this insight we developed user journeys and service outcomes. The main question was how could technology deliver this transformation? On its own - it simply can’t. It needs customer facing areas to understand the potential, support from policy and strategy, and the delivery capability to turn it into reality. Our other challenge was how do we communicate a technology and service transformation in a straightforward way? We started with the end in mind and reminded ourselves of user outcomes, challenges and technology requirements. This allowed us to develop the ‘roots’ of the project (the technology that would shape all future services). 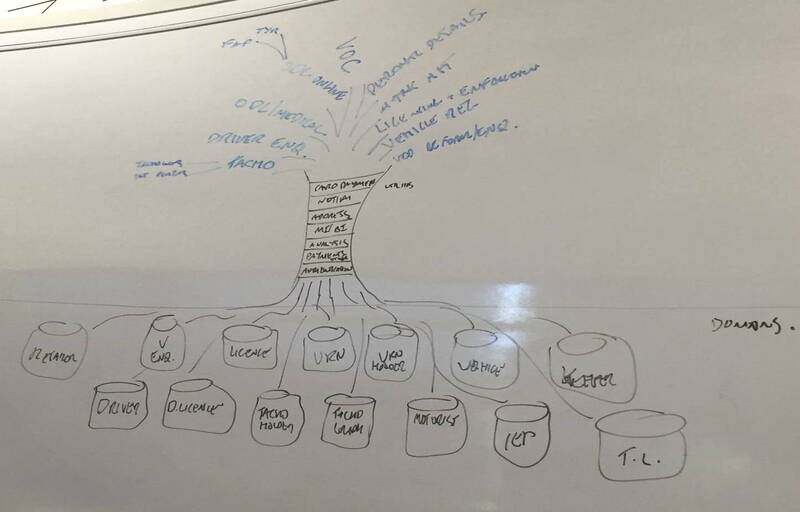 We then looked at all of the common elements, services and platforms that hold all of the services together - creating the ‘trunk’ of the tree. We imagined how the services would grow and develop, referring to these as the ‘branches’ coming out of the main body. We visualised how they would evolve and eventually lead the move away from our usual infrastructure. This process taught us that creating a perfect plan for a transformation this big is unrealistic. We realised that we needed a flexible attitude ready to try things, and to learn from mistakes. This is the start of a new way of working by testing, failing, changing and trying again. We now have a roadmap and a set of outcomes we can work towards and will continue using this agile method of working during the next phase of our work - making it happen. Keep an eye out for future updates. Being a simple motorist of advanced years I am afraid you have completely lost me, I'm sure you had a good time and it's a literary and intellectual masterpiece, the end of which completely eludes me. The roadmap helps us to plan how we will do that. It would be interesting to know your end point, when you wish to get there, what resources you have and what budget limitations there are. Who is the leader and what is their driver. I've spent a whole lifetime in project/business management and as you correctly say it's all about the 'SOR' Statement Of Requirements. Change is all important, stagnation must be avoided and a basic route map should be published. Why not start at the end with what you want to achieve then work backwards on the steps to achieve your aims. I'm a silver surfer that likes user friendly quick scans using keyword searches that work. Thank you. A lot of words meaning NOTHING. Everyone is a customer and everyone has customers. Do you provide what customers need NOT WHAT YOU THINK THEY NEED. Invest in a good CCQ course COMPLETE CUSTOMER QUALITY. Are you providing what your customer Requires?? If you received the information you produce would you be satisfied? Are you satisfied, as a customer, with information you actually need to function so your customer is satisfied? DVLA develops all of its services based on what our users need. We undertake extensive user testing of all our services with customers in a range of methods and locations including DVLA’s own UX Lab. The popularity of our digital services is testament to the amount of effort that goes into user testing. Rohan PLEASE READ previous comments. You all must have a Masters degree in Advanced Gobbledygook and the Supply of Utter confusion. The only words of any wisdom and meaning are those of the folk who take the trouble of trying to be helpful, all to no avail. can I obtain an English translation anywhere? From an interpretation of this twaddle, I can at least ascertain what (or who) should be buried under the bottom of the tree. Fascinating - but what and when? I agree with previous comments - keep it simple please otherwise this nonsense is not worth reading !